The Palazzo Comunale (Town Hall) is one of the most important examples of medieval civic architecture in Maremma. Its building started in the 13th century after the concession to Suvereto of the "Charta Libertatis", in 1201, by the Count Palatine Ildebrandino VIII Aldobrandeschi (feudal lord): as the charter allowed autonomy, and self appointed officials too, the community needed a palace to house such a government. Following the concessions of 1201, Suvereto had become the first free "Comune" (typical post-feudal form of goverment) in the northern Maremma and its inhabitants had gained a series of significant rights, such as the right to buy and sell properties, and to allow new settlements within the walls. The layout of the building clearly reflects the administration of such varied needs, one of the most important of which was the holding of courts to settle disputes between the citizens. 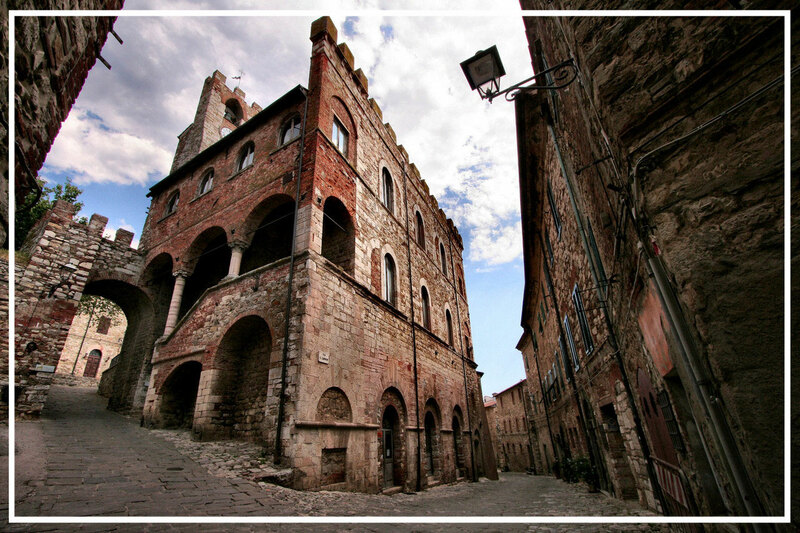 The Palazzo Comunale is topped by an ancient tower which now houses a clock, but once housed the bell that was rung to call an assembly of the Town Elders - the Anziani - and also served as a lookout within the community. The entrance to the building is preceded by a short and steep stairway under an open loggia supported on columns. This was the "loggia dei giudici" from which judgements and sentences were pronounced. 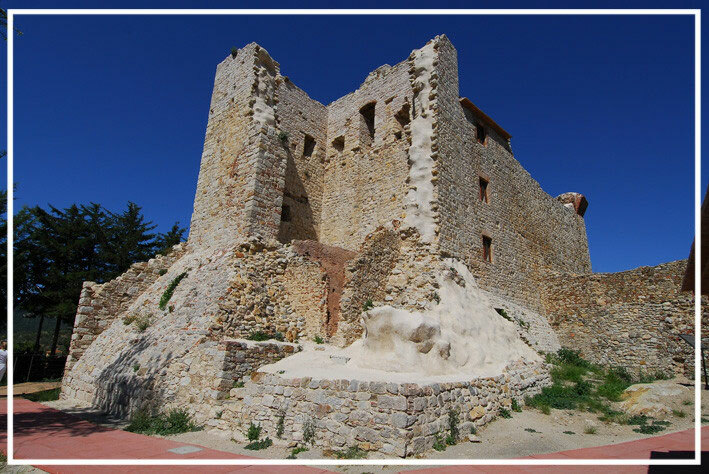 The castle of Sughereto or Suvereto is situated in the foothills, almost at the foot of a knoll, which dominates towards the south a large, fertile and pleasant plain…… at the present day, the castle of Sughereto is enclosed by walls with two gates and a keep. Thus Agostino Cesaretti described the castle of Suvereto in 1788.Rocca AldobrandescaThe beginnings of the castle, are closely linked to the history of the central keep, placed "on the highest part, towards the north". Archaeological excavations carried out by the University of Siena in 1989 brought to light a series of post-holes inside the later stone keep, which, dating to the 9th century, are the earliest traces of settlement on the site. The earliest stone structure on the site is the tower, most likely built around 1164 on the orders of the Aldobrandeschi Counts, notwithstanding the fact that at the time they were in a close rapport with the Pisan republic. It was the Pisan Republic itself that was to build the walls of the village and the strong defensive keep on the northern side. These works were linked to altered defensive needs, along with new political ideas regarding the management of the territories of the state. The building programme was completed in 1308, as an inscription placed on the entrance to the walled enclosure bears witness. Thus there was a walled area roughly trapezoidal in form extending away from the tower and furnished with two gateways. The buildings and other amenities necessary to house the garrison of Pisan troops were placed inside this area. The castle underwent various alterations through time until it was definitively abandoned as a defensive structure around the year 1600. In the 19th century the building was adapted to serve as housing, a three storey building being added onto the side of the tower, within the fortified area. Towards 1950 this building was in turn abandoned and at the end of the 1980’s the area came into the ownership of the Town Council. Following the excavations of 1989-90, a programme was put in hand to restore the complex to its ancient state. 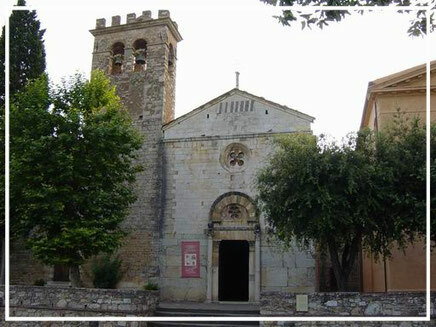 The parish church is consecrated to San Giusto, the Bishop of Volterra, who came to the Cornia valley in the 5th century, along with others from North Africa such as Cerbone, Fiorenzo and Regolo. 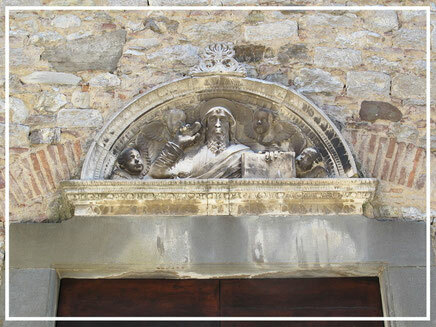 The presence of these saints is remembered throughout the valley: Fiorenzo is the patron of Campiglia Marittima, whilst the cathedral of Massa Marittima is consecrated to Cerbone. The memory of Regolo lives on in place names near the sanctuary of Frassine. The exact date of the church – which is thought to have been built over the remains of an earlier one – is not known. Two brief texts dating back to 923 and 924 are the earliest evidence that we have for its existence. The building as we see it today was finally completed in 1189 by Barone Amico and Bono de Calci, as an inscription in the left transept testifies. The church has a Latin cross plan, with a single nave and apse. The façade has a fine portal with a rose window above. The tympanum is decorated with alternating strips of black and white. Running around the building the windows are simple single-hole openings. The Romanesque portal is composed of two jambs supporting a shelf, the first decorated with vegetal ornaments with a central sculpture in the form of a human head, and the second with geometric forms. Above these the architrave is adorned with vines issuing from the mouth of a centrally placed figure. Two lions feature on the side columns, each holding human figures in their busts. Inside the building there is a fine octagonal font in sculpted stone dating back to the 12th century. This is now placed in a room at the base of the bell-tower, which has been decorated with mosaics by the Vatican School of Mosaics (second half of the 20th century). The pipe organ in the left transept dates 1718 and is the work of Domenico Francesco Mazzoni. 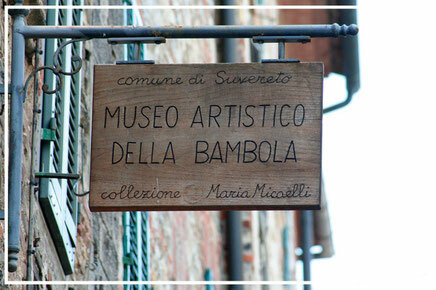 It was previously housed in the church of "Madonna sopra la porta". On the left side of the church there is the rectangular bell-tower, not in perfect alignment with the façade itself. The belfry has a biforate window with ogival arch on the wider side, and a simple single window on the shorter one. The bell-tower was damaged by lightning in 1884 and restored by local craftsmen. This restoration work altered the appearance of the campanile by eliminating some of the original Romanesque features. The remains of the ancient monastery of St Francis can be found at the summit of one of the two hills which lie within the walls of Suvereto. 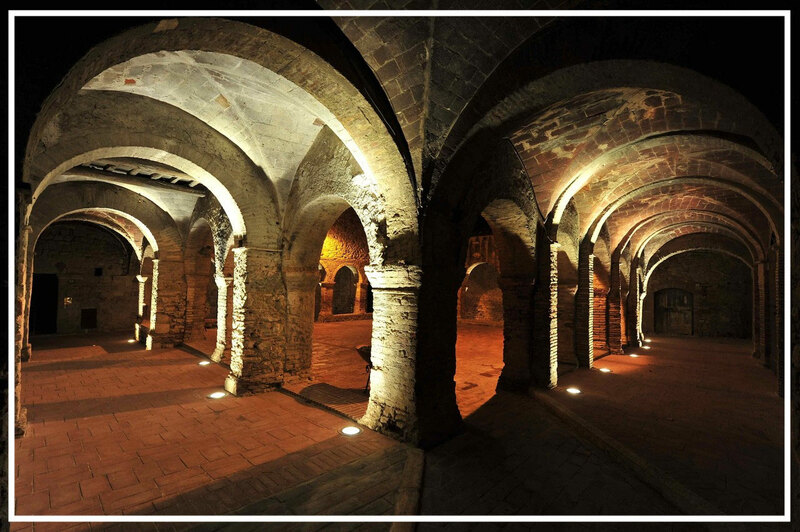 Founded in 1286 on the land donated by the Aldobrandeschi Counts from Santa Fiora, the feudal lords of the town, the monastery was consecrated by Fra Bartolommeo, the Bishop of Grosseto, as the historian of the Order Rodolgo tells us. Historically, the Monastery was of a certain importance, but this did not allow it to survive the suppressions of the Napoleonic period. In fact it was definitively closed and its properties redistributed in the early 19th century by Elisa Bonaparte Baciocchi, Princess of Piombino and Lucca. The cloister can still be seen today as an architectural unity. Square in plan, on each side there is a colonnade formed by five arches supported on pilasters. A cistern was originally in the centre of the cloister, and the modern name derives from this (piazza della cisterna). A handful of traces of the façade are all that remain to remind us of the function of the adjoining building, once the church, and now transformed into holiday homes. Entering the Monastery buildings – now private housing – the visitor may see architectural elements and inscriptions that testify to the original function of the site. In particular, the old portal is worthy of note, finely ornamented, with the coat of arms of the Giannetti and the Angelieri families, and various funerary and commemorative inscriptions. In the summer of 1313, on the land near the Monastery, the body of the Holy Roman Emperor Henry VII of Luxembourg was burnt ("fue cotto"). The Emperor had died at Buonconvento on 13 August of that year, and following his last wishes, the corpse was buried in Pisa, the most important Ghibelline town in Tuscany. When the cortege arrived in Suvereto – an adherent of the Ghibelline League since 1237 – it was decided to stop in order to preserve the body from decomposition. Thus the mortal remains of the Emperor were ‘exposed to the flames’ to better maintain them. It seems that his body remained in the town for two years awaiting the completion of his tomb in Pisa, and there, in the monument created by Tino da Camaino, the Emperor reposes still. First built in 1480, this church was altered and enlarged in 1772 to commemorate a miracle which happened in 1767. In that year the population risked death by drowning, due to a great flood because rainwater could not flow out from the grids placed under the heavy gates of the town. When everything seemed lost, the gates opened inward, notwithstanding the pressure of water, which could thus flow away. The next morning, when the garrison housed above the gate went into their chapel to pray, they noticed that the floodwaters had just touched the border of the painting of the Madonna which was kept on the altar. It was thus decided to build a sanctuary to house the miraculous effigy. The painting of the Madonna and Child, which dates back to the 16th century, is placed in the centre of an altar built of wood, plaster and marble. Behind the altar the original wooden choir stalls can be seen, whilst the frescoes on the vault and in the apse dated 1858 show the Holy Family, the Assumption of the Virgin, the Immaculate Conception and other theological scenes. A lunette above the doorway – which was probably taken from the earlier church – has been attributed by many historians to the hand of Vittorio Ghiberti. The bas relief shows the blessing of the Redeemer, and almost certainly dates back to the 15th century. 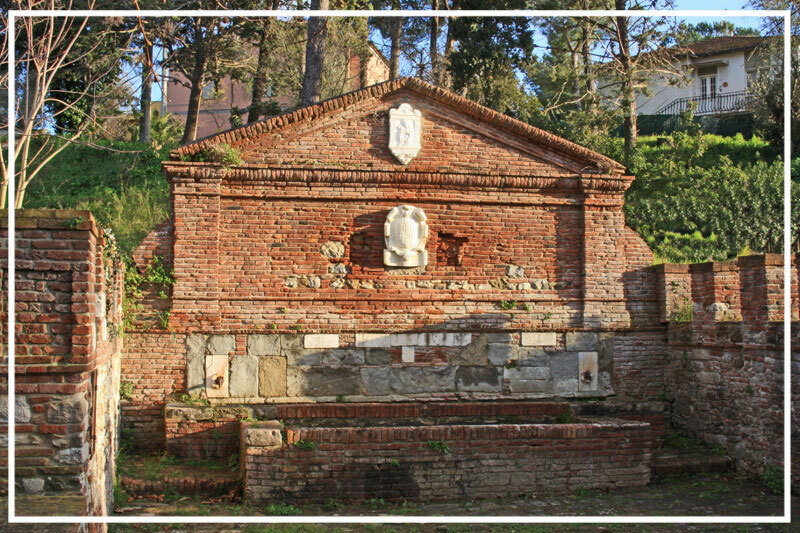 Near the town, on the road to Monterotondo , this complex restored in 1582 by James VI of Appiano , Prince of Piombino , has been from time immemorial , a major source of water for the community . The fountain is equipped with two rectangular tanks huddled . Behind them lies a front decorated with two marble slabs each bearing a rosette from which flowed the water jet . The sides of the fountain are constituted by two crenellated walls . The central pediment bears the copy , powdered marble , the Madonna della Fonte degli Angeli of Andrea Guardi ( the original is on view at the Museum of Sacred Art ) . Below there is the coat of arms , restored in 1998 , the family Appiani , princes of Piombino , with commemorative inscription. On either side of the coat of arms they were placed two marble panels depicting the coat of arms and stolen several years ago . 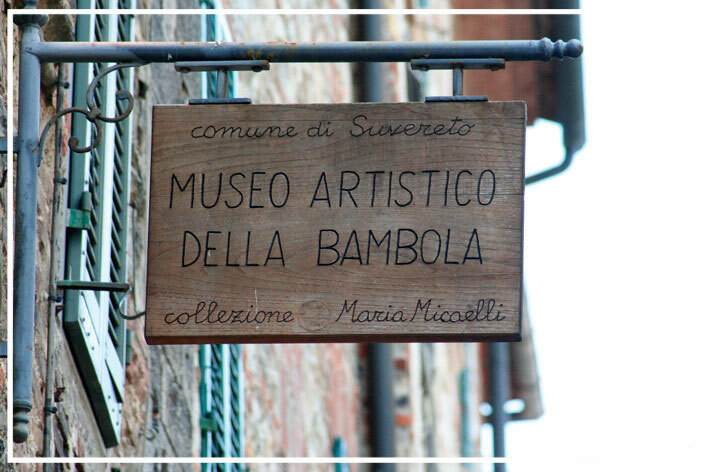 The Sagra is the meeting point between the flavors, culture and folklore. Held for the first time on 29 December 1968, the Sagra now takes place in the days to close on 8 December, with events aimed at enhancing the country's history and its culture. From the gastronomic point of view, the Sagra offers the best quality of its products, including olive oil and wine from all local companies and the opportunity to sample a variety of dishes made of wild boar. Noteworthy is the historical parade, a reconstruction that, thanks to the presence of numerous people in costume, gives guests the opportunity to see a glimpse of life at the time. During every day of the Sagra it will be held also a market for the town's streets with dozens of exhibitors and handicrafts and local products. 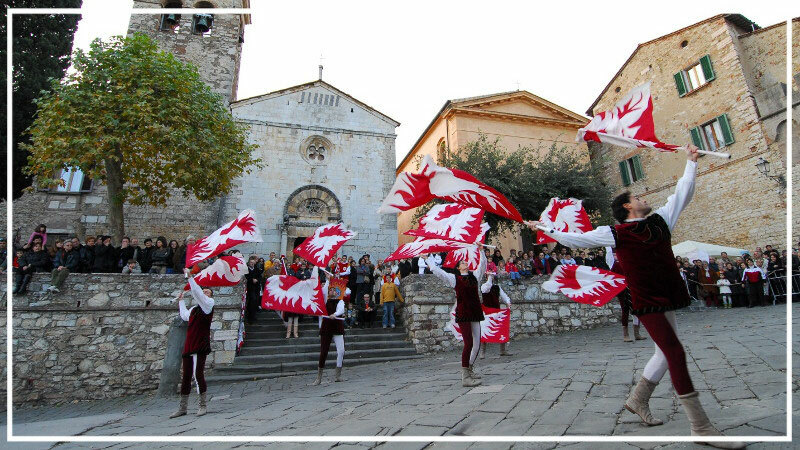 The Palio of Suvereto is an event that takes place twice a year. 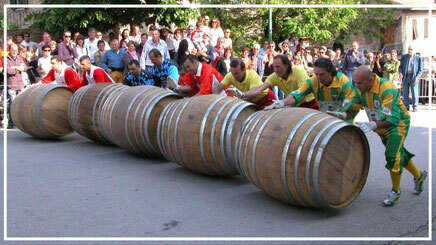 It is a competition between teams of "pushers", which takes place through the cobbled streets of the old town. The pairs of pushers push the barrel on the circuit trying to beat players. The first, the Palio of Santa Croce, is held in May, while the latter falls on August 14 and is called Palio dell'Imperatore. Suvereto is divided into terzieri, Castello, San Francesco Borgo. Castle (black and yellow) is the right part of the country closer to the Aldobrandeschi fortress, St. Francis (red and blue) instead is on the left and takes its name from the convent. Borgo (green and yellow is the outermost part of the country. These terzieri adding fractions, Forni and Ferriere (red-yellow), Prata (red and white), Belvedere and San Lorenzo. Some old rooms on the via Magenta are home to the ‘Artistic Doll Museum’. The collection on display here was formed by Maria Micaelli and donated by her; it represents an important cultural patrimony, as the expression of the continuing evolution of technical methods of manufacture and deep-seated research regarding materials – wood, papier-mâché, porcelain, biscuit and cloth. To create a link between the dolls of yesterday and those of our days, a section is given over to the dolls of the 50s, produced in rigid plastic and characterized by moving eyes and ‘speaking’ voices. To round things off, complete the vision, and aid the comprehension of the ‘doll’ phenomenon, the museum has small bookshop with pictorial materials, publications, accessories, paper dolls and other items.